CLOUDWALKER: CONTEMPORARY NATIVE AMERICAN STORIES by Joel Monture (Mohawk), illustrated by Carsen Waterman (Seneca) (Fulcrum, 1996). Features characters from a variety of Native nations. Ages 9-up. 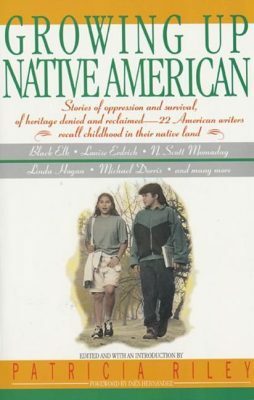 GROWING UP NATIVE AMERICAN: STORIES OF OPPRESSION AND SURVIVAL, OF HERITAGE DENIED AND RECLAIMED ‘ 22 AMERICAN WRITERS RECALL CHILDHOOD IN THEIR NATIVE LAND edited and with an introduction by Patricia Riley (Cherokee), foreword by Ines Hernandez (Nimipu/Mexican Indian) (Avon, 1993). An amazing array of stories by some of the most talented voices in Native American literature, including Louise Erdrich (Turtle Mountain Band of Chippewa), N. Scott Momaday (Kiowa), and Linda Hogan (Chickasaw). Ages 12-up. INDIAN SHOES by Cynthia Leitich Smith (Muscogee (Creek) (HarperCollins, 2002). Ray and Grampa Halfmoon are Cherokee-Seminoles who face the challenges of daily life with love and humor in this collection of short stories set in Chicago and rural Oklahoma. Together, they encounter homesickness, bad hair cuts, mystery, artistic competition, and a wedding without proper pants for the ring bearer. Ages 7-up. MOCCASIN THUNDER: AMERICAN INDIAN STORIES FOR TODAY, edited by Lori Marie Carlson (HarperCollins, 2005). An anthology collection of short stories about contemporary Native American teenagers. Contributing authors: Joy Harjo; Sherman Alexie; Cynthia Leitich Smith; Richard Van Camp; Linda Hogan; Joseph Bruchac; Louise Erdrich; Susan Power; Greg Sarris; and Lee Francis. Ages 12-up. More on this title from Cynsations. Read The Story Behind The Story from Lori Marie Carlson. RISING VOICES: WRITINGS OF YOUNG NATIVE AMERICANS selected by Arlene Hirschfelder and Beverly R. Singer (Santa Clara Pueblo)(Ivy, 1993). Real words from real kids. Ages 8-up.